By the time that was written, Mick had sung “Midnight Rambler” in pink top hat and tails; after Altamont, the Stones would for reasons of self-preservation turn toward comedy. But in 1969, few people at Madison Square Garden on Thanksgiving Day thought that what the Stones were doing was a performance. ...The people inside Madison Square Garden on this Thanksgiving had, most of them, lived through a time of cold war, hot war, race riots, student riots, police riots, assassinations, rapes, murders, trials, waking nightmares. 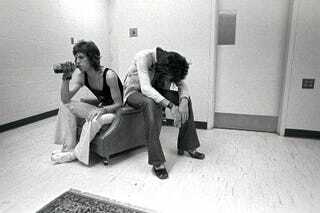 But Keith, Mick, Charlie, Bill, and the new guitar player were impersonating the Rolling Stones, and the audience were impersonating their audience, both of them at the moment a great success. Dancing under the circumstances (“Oh, Carol! Don’t ever steal your heart away—I’m gonna learn to dance if it takes me all night and day!”) seemed to have a transcendent value. Many people thought then that dancing and music could have a major role in changing the structure of society. They may have been naive, but they were much more interesting than the sensible people who came along later. The Stones would tour the United States every three years for a long time to come, and the value of dancing would never be less than transcendent, but at Woodstock, only a few months before and a few miles away, music had seemed to create an actual community. There was—at this time, for many members of this generation—a sense of power, of possibility, that after Altamont would not return. He is strongest when writing about the music — the history of it, the business of it, and the experience of it. Booth’s believer’s passion results in all sorts of luminous insights into the enterprise: “The Stones’s show was not a concert but a ritual; their songs . . . were acts of violence, brief and incandescent.” And later, “Making love and death into songs was exactly the Stones’s business.” Booth tells a story in which “Each night we went someplace new and strange and yet similar to the place before, to hear the same men play the same songs to kids who all looked the same, and yet each night it was different, each night told us more.” He suggests that “In the sixties we believed in a myth — that music had the power to change people’s lives. Today people believe in a myth — that music is just entertainment.” He writes about what it was like backstage and what it was like in the audience, what it felt like when things really clicked and what it was like when they did not.